If you like blue, this is your place. Under a broad sun, the ocean is a field of undulating sapphire with such texture and richness that the eye searches its depths longingly for it knows not what. I stand at the weather rail, ostensibly studying cloud in an attempt to ferret out the next squall. But in fact, I am staring into the blue yonder; hypnotized by blue, bathing in blue. I scoop it up for cleaning dishes expecting to bucket blue, but the blue escapes the bucket. Always and forever right there and out of reach, the big blue. I’m struggling to balance Mo today. Same old story. Wind fluctuates. I reef after hours of being heeled so much I pull a couple Gs just sitting here. The wind drops. After an hour of this, I pop the reef. Wind jumps. I’ve opted to stay over-canvased. We do a steady six knots with here and there touches of seven. Not a bird today. 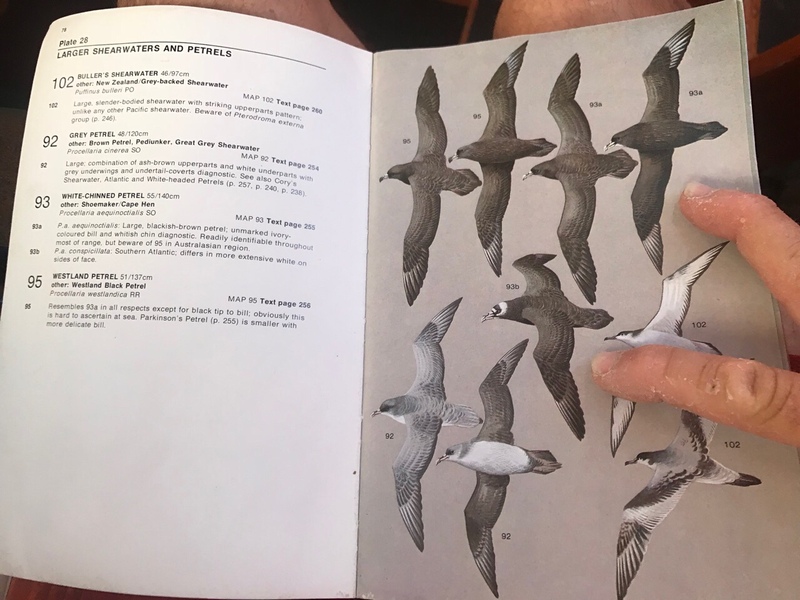 For a week the only bird species I’ve seen is the Atlantic variant of the White Chinned petrel, which was our constant companion in the south and one of my favorites. The White Chinned gives the unmatched grace of the Wanderer a run for its money. Small by comparison (in overall size, just smaller than a Western Seagull), they are stocky, compact and efficient gliders and live in a covering of chocolate brown feathers, save a tiny spot of white, a stinger, just under the bill. In the south, they would often accompany Mo all day in groups of three to five and would frequently swoop in close over the radar tower to examine the odd gesticulations of her passanger (I was just saying hello). The Atlantic variant is quite different. For one thing, it sports a mask of white that gives the impression it is wearing a Batman costume. For another, it usually travels alone. Yesterday near sundown a group of five played around the boat for a time, a first. None at all today is also a first. We may be exiting their range. It is strange, this lack of bird life here after the recent months of avian fellowship. If we were northing in the Pacific, the Cook Islands would soon hove into view. The “kreck” of Tropic Birds would call me on deck. Boobies would be competing for night accommodations on the rail. But I guess that’s the difference. 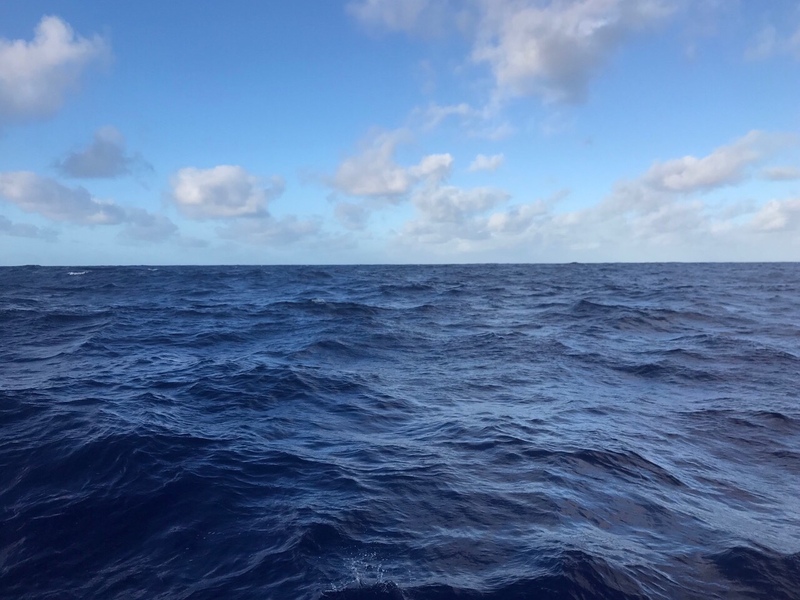 We’ve not passed close to any islands, as yet. It’s no longer a blue world, Max… Where will we go? Engenders embracing and chasing of blues! The very best word for the whole world to use! A huge fan of wonder creature adaptations, passive flight of the albatross is very high up on my list of amazing animal feats. Flight recordings show distances of thousands of kilometres as well as flights around the world in 46 days, all with nary a single propulsive wing stroke. As a zoology student in 1976, I thought I was the first to figure out their trick, only to find — after days in the bowels of my university library — a 1923 scientific paper that “stole” my entire discovery. Anyway, like you Randall, they are solo, highly efficient travelers that navigate and travel huge ocean distances, using someone else’s energy; the wind. 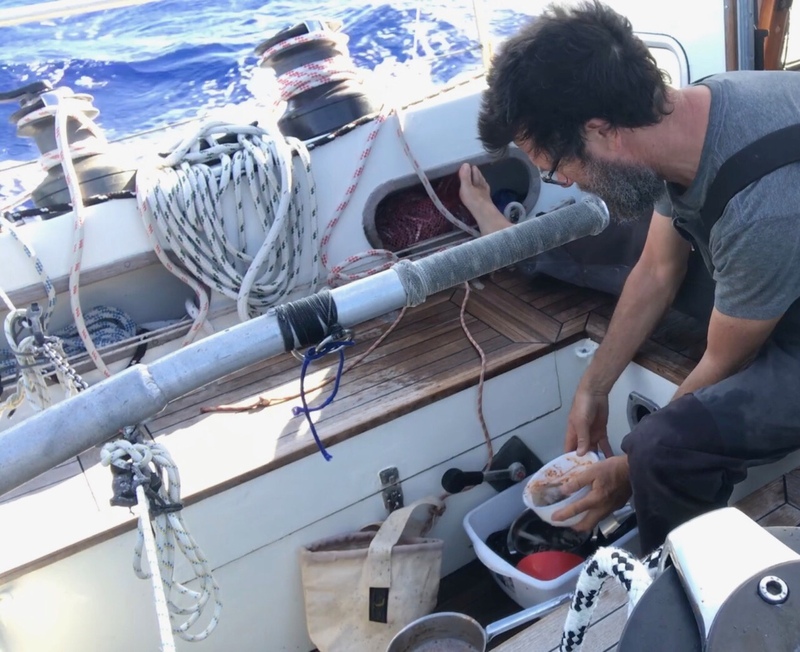 The albatross’ trick is to utilize wind shear (akin to ground-effect); the fact that waves and ground friction reduce wind velocity near the water. 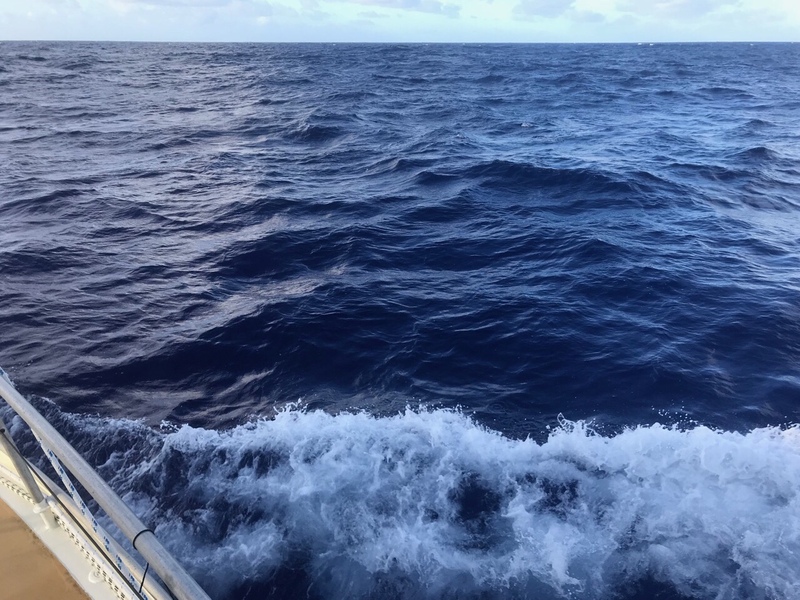 30 knots of wind at 30 feet up, approaches 0 knots near the surface. In very simple terms, the albatross scoots through low velocity surface winds, and before its airspeed gets too slow, it banks up into the faster oncoming wind (effectively propulsion), thereby sustaining flight. 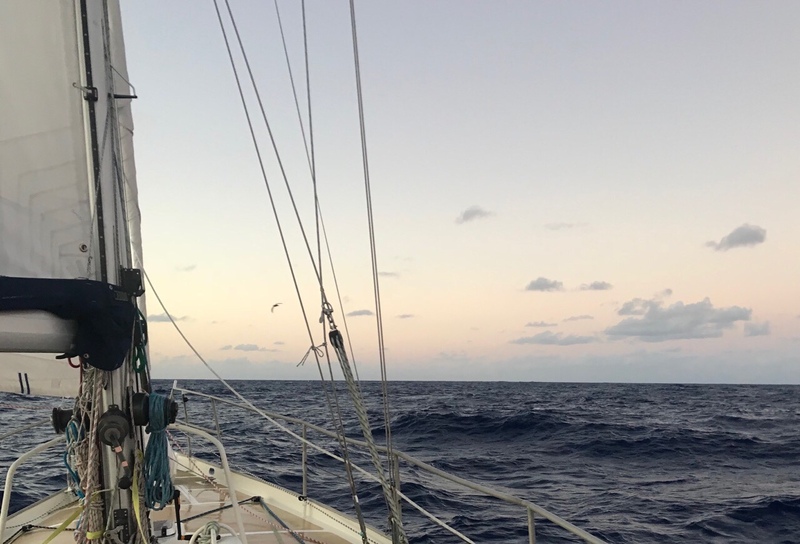 The same thing happens on the backside, when, just as its relative airspeed gets low while flying to leeward above, it banks back down to the surface, its inertia propelling it into low wind (but high apparent wind, to the albatross), just above the waves. Although I don’t believe in perpetual motion, I still have to scratch my head to consider how the albatross hasn’t come awfully close to it. Unfortunately, the best tech paper I quickly searched and found on this subject today, gasps for any real hope of readability, and I suspect might even be wrong in certain ways. The glory there though, is that it is still a wonder of nature to ponder for us other creatures that like to travel. ps, thanks Randall, I’m a total F8 groupy.